The Eaters is a new fast food place in GK2 M-block market doing American-style comfort food. They've got hot dogs, burgers, fries, sandwiches, and refreshing shakes. American breakfast, non-veg burgers, strawberry Nutella milkshake. If your go-to comfort food consists of juicy burgers, some oh-so-cheesy Mac 'n' Cheese, and refreshing coolers to wash it down with, this newbie in GK2 is your American (junk food) dream come true. Calling all The Eaters, these guys have on their menu what we'd consider meals for the soul… or you know, for the hangover. They've got meaty burgers and slider combos, open sandwiches, loaf and pita sandwiches, mac 'n' cheese bowls, hot dogs, and fries (yes, they do have peri peri). 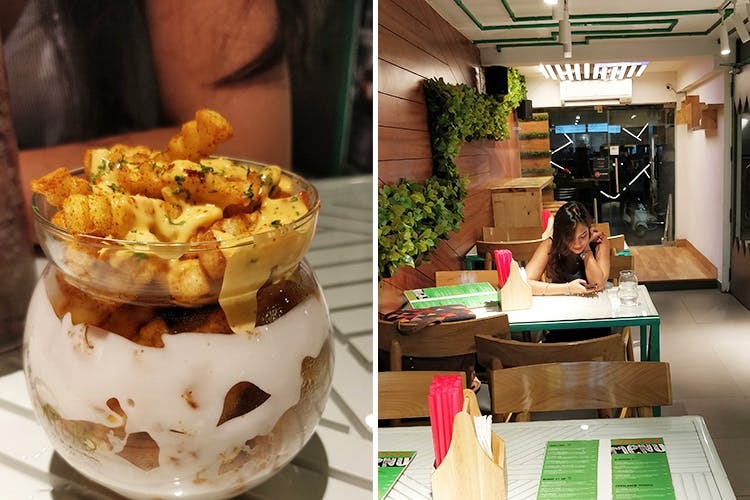 For the big eaters, they've got American platters that'll have an assortment of fries, wings, a burger and a shake–both veg and non-veg variants are available. Their breakfast menu will treat you to sausages, eggs, hash browns, fruit and more. Don't forget to check out their chillers and shakes section for some hard-to-put-down options–they've got a cheesecake shake we cannot wait to try! While they've got a 'dessert coffee', we wish they'd come up with a complete dessert section, so we could satisfy both our sweet and savoury cravings in one place. Go here on hungover Sundays for the complete fix.